Bing Crosby’s White Christmas was the first to do it and Gene Autry’s Rudolph The Red-Nosed Reindeer was the second, this week’s suggestion was the third, but first non-seasonal song, to do it. Do what? Sell three million copies in America. Yes, Elvis Presley’s Hound Dog did it in 1956 and helped by the facts it spent 11 weeks at number one on the Billboard singles chart. 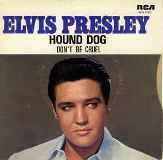 Hound Dog in its original incarnation doesn’t sound much like we know the Elvis version. It was written by the Jewish American songwriting and record producing partnership of Jerry Leiber and Mike Stoller in 1952 and first recorded by the blues singer Willie Mae ‘Big Mama’ Thornton in that year but not issued until March the following year. Her version spent 14 weeks on the US R&B chart, seven of them at the top. There was much controversy about Elvis’ gyrating hips in the 1950, so when he performed the song on the Steve Allen Show he was told that his movements were not be received well on a family friendly show, so instead Elvis sang the song to a bassett hound. The song, was featured in the 1994 film Forrest Gump where Gump remembered an occasion when a young Elvis stayed at his home and when he played Hound Dog, Gump, in his leg braces, began to dance and claimed that it inspired Elvis’ famous dance moves. The song has been covered by a number one acts including John Lennon, James Taylor, Jerry Lee Lewis, The Everly Brothers, Jimi Hendrix, Little Richard, Status Quo, Van Morrison, Robert Palmer and The Muppets.